As the poorest of the great powers, Italy could not easily equip her armed forces with modern weaponry despite spending a massive proportion of her gross national product on her military. Through great efforts, new weapons and vehicles arrived in the 1930’s; by the time Italy went to war in 1940, many of these had been worn out through use in Spain or Ethiopia, and those that survived were often obsolete. Well-designed new weapons existed in prototype form, sometimes entering production in limited numbers. Italy went to war with a mixture of old and new arms, though in Italian East Africa the armory tended toward the old. 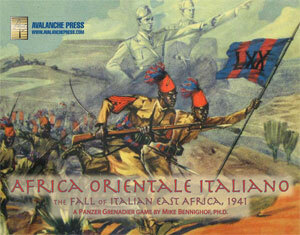 The Italian side in Panzer Grenadier: Africa Orientale Italiana goes to war without much in the way of support beyond the bayonet. But they do have a few weapons. The 65/17 Model 1908/1913 mountain gun went through a lengthy development before the Great War. When finally introduced into service it became the first modern artillery piece wholly designed and manufactured in Italy. It offered ruggedness, reliability and portability; it did not offer much elevation, which greatly limited its effectiveness in its designed role as a mountain gun. 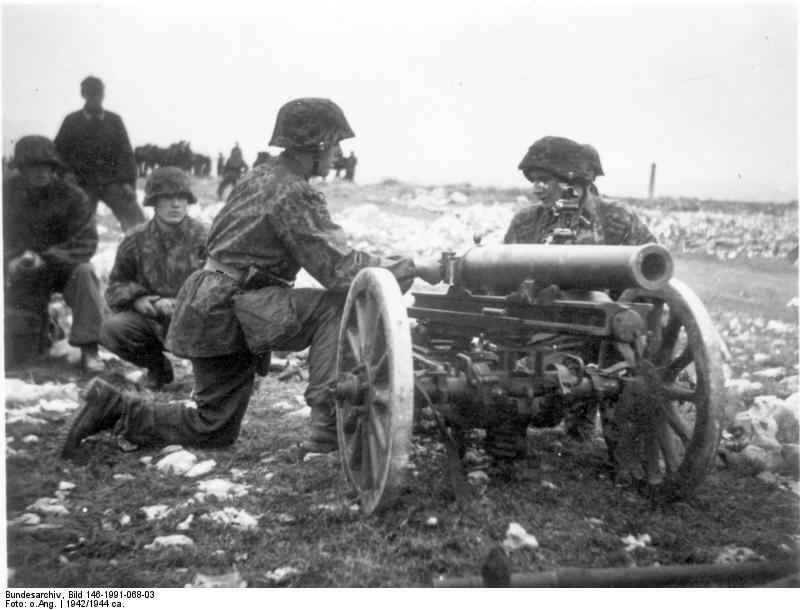 After the war, the Alpini replaced the 65mm piece with captured Austro-Hungarian 75mm mountain guns while the 65mm piece went to infantry regiments as a direct-support infantry gun. There, its flat trajectory would be less of a problem. The gun gave good performance against Libyan resistors in the 1920’s, as its relatively light weight allowed it to be mounted on the back of a truck, an arrangement that would become common throughout its service life. 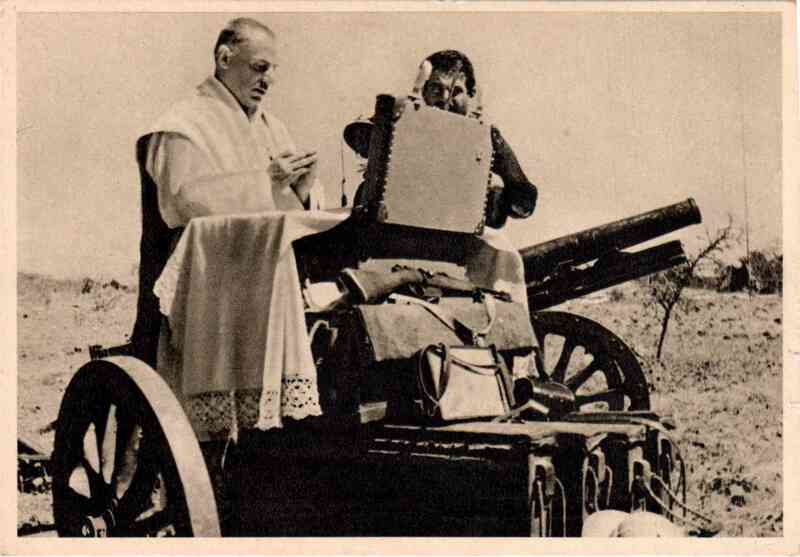 Mass is celebrated on a stack of 65mm ammunition panniers. Ethiopia, 1936. The mid-1930’s would be the highpoint of the 65mm gun’s service. The Italians sent 343 of them to Spain, both to equip Spanish Nationalists and with the Italian “Volunteer” corps. They armed the artillery regiments of regular, Blackshirt and colonial divisions in the invasion of Ethiopia as well as the infantry gun companies of the infantry regiments, which also served in the anti-tank role. Production resumed to replace guns lost in action, given to the Spanish or worn out. In 1935 the Royal Army purchased 279 47mm infantry guns from Austria’s Böhler artillery works as well as a production license. Two dozen of them went to Spain with the “Littorio” volunteer division, performing well in both the direct-support and anti-tank roles. The new gun replaced the 65mm piece in the infantry regiments, but it remained in service with Blackshirt and colonial artillery regiments, and could still be found in regular divisions until the end of the war. The 80th “La Spezia” Air Transportable Infantry Division, formed and trained for the abortive invasion of Malta, had the 65mm gun as its sole artillery piece with a special three-wheeled Moto Guzzi motorcycle as its prime mover. The 65mm gun had a fairly short range and suffered from its inability to perform indirect-fire missions thanks to its flat trajectory. It became far more effective in 1942, when the Royal Army began to issue a high-explosive anti-tank (HEAT) round that could penetrate the armor of the new American-made Grant and Sherman tanks. The new ammunition remained in short supply for the rest of Italy’s participation in the war. In Italian East Africa, the 65mm gun represented almost the entire inventory of artillery. Colonial infantry brigades had a single battery as their artillery support; even the elite 65th Granatieri di Savoia Division had 65mm guns equipping its artillery regiment. The gun’s mobility proved useful, and it could be dismantled into five pieces and loaded on camels. War criminals pose with a captured 65mm cannon. It remained a popgun, however, with a larger high-explosive charge than one might expect from such a small caliber but still tiny compared to that of a real artillery piece. In Panzer Grenadier terms it probably should be limited to direct fire. Infantry assaults often became necessary to drive the British and Indians off high ground, since their little cannon couldn’t harm enemies on the reverse slopes of hills. Known as the Elephantino, or “Little Elephant,” (due to its unusual profile), at the time of its adoption, the 47/32 was probably the most effective anti-tank gun in service anywhere; Czechoslovakia’s Skoda Works produced a 47mm gun with similar capabilities but most anti-tank guns were of smaller caliber and often lacked a high-explosive round. Intended as both an anti-tank weapon and an infantry-support gun, it performed both missions well with good performance against armor and a good high-explosive round. The weapon still had some drawbacks. Reloading proved a slow process, a serious problem since enemy tanks rarely waited to be shot at. It had no splinter shield, leaving the crew exposed to enemy small-arms fire, though the wheels could be removed to lower the weapon's profile. Nevertheless, the Royal Army went all-in on the Austrian weapon. Each infantry regiment would receive (at least on paper) an anti-tank company with eight cannon, with an additional company assigned to each infantry division. In the Alpini divisions, each battalion received two platoons, each with two guns. Parachute divisions equipped their artillery regiments solely with the 47/32 cannon. 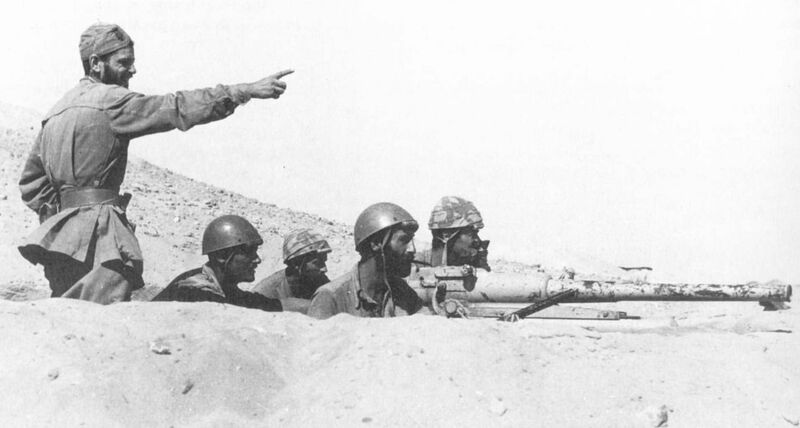 In 1942, the new AS42 organizational tables for infantry units fighting in North Africa called for even more guns, with each rifle company including a platoon of three guns while the regiments and divisions retained their separate cannon companies. Lt. Gianpolo directs a 47/32 of the Folgore Parachute Division at Alamein. A modified version of the 47/32 served as the main armament of the M13/40 medium tank and its slightly-improved successor, the M14/41. It also armed the small Semovente 47 tank destroyer, and some were mounted on AB41 armored cars and many more placed on trucks. In 1942 a new model appeared, though it never saw service. The 47/40 featured a longer barrel, considerably raising its muzzle velocity and therefore armor penetration, and a larger chamber allowing a bigger propellant charge (contributing to that increase in velocity and penetration) and a heavier high-explosive round. A modified version of this gun armed the M15/42 medium tank (which never served in Africa) and the M16/43 “Sahariana” fast tank. Italian forces in East Africa had only a handful of these guns, most of them assigned to the 65th Granatieri di Savoia Division, but the one platoon detached to support the colonials proved effective against British tanks in the Battle of Gallabat. The high command in Addis Ababa had independent anti-tank company at its disposal, but that was the extent of the gun’s deployment I the colony. Unlike the 65mm gun, the 47/32 had not seen action during the invasion of Ethiopia and so none of the weapons were left behind to arm the garrison when the Italian invasion force returned home. You can order Africa Orientale Italiana right here.